This surreal painting by Canadian artist Stephen Gibb portrays a commentary on consumerism symbolized by the central figure of the all-consuming-mouth monster devouring candy, pastries and chocolate. The central elements contain benign, candy-coloured characters but give way to the austere, menacing and depraved characters that loom on the fringes. The specter of death with it’s grindstone nose, the onion spirit and other unsavory images of decay, disgust and filth frame the sweet interior. The contrast between the desirable and the repulsive adds to the tension of the the concepts at battle. The title “Dopamine” is in reference to the reward centres of the brain that get flooded with dopamine when stimulated by the powerful feelings of pleasure associated with sugar consumption; however, these excess neurotransmitter levels also take a long-term toll on brain chemistry and can even promote substance dependency. Go to facebook for more Canadian Pop Surrealism and Bubblegum Surrealism images with links to more content and info. Bubblegum Surrealism: Stephen Gibb – Artist Statement, pop surrealism canada, canadian pop surrealism. probing into the outer perimeters of human nature and surrealism. My direction as of late has been to devote more to composing on the panels rather than in sketches. see stephengibb.com for more Canadian pop surrealism. 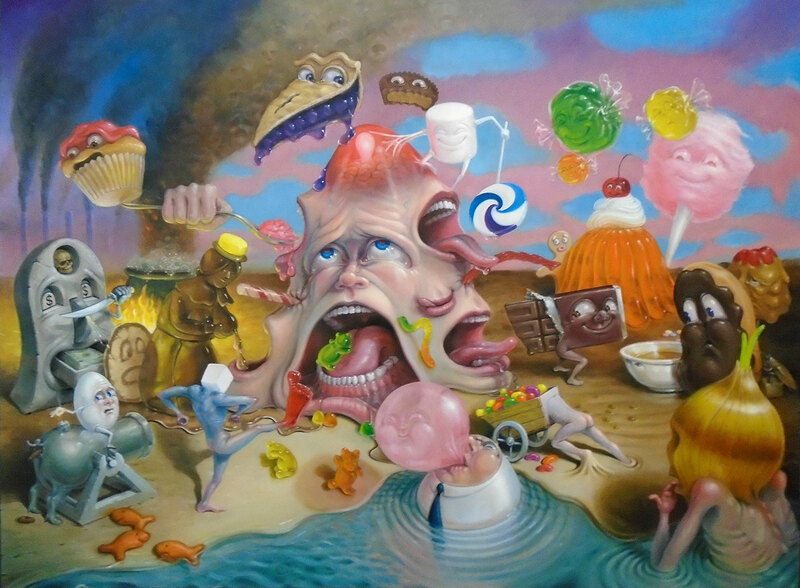 This entry was posted in Canadian Surrealism and tagged art, artist, bubblegum surrealism, canada, canadian, canadian pop surrealism, dopamine, humpty dumpty, painter, painting, pop surrealism, pop surrealism canada, stephen gibb, steve gibb, surrealism. Bookmark the permalink. Both comments and trackbacks are currently closed.